to shy away from humans, armadillos cause problems when they begin tearing up yards while feeding on insects such as grubs and spiders. What can become even more frustrating are the costly repairs that may be needed if an armadillo uses its sharp claws to start burrowing under your structures in search of shelter. Armadillos make themselves at home in Florida. Attracted to the warm, humid weather, they prefer not to live in places that have extremely cold or dry climate conditions due to their lack of fat tissue and their inability to retain water. Since they are nocturnal, it’s unlikely you’ll catch an armadillo in the act of destroying your yard or garden since they’re probably wandering onto your property when it’s dark, and you’re inside. The most apparent signs that an armadillo has gotten into your yard are the small burrows, as deep as a couple of feet and the little holes left from looking for food. Removing armadillos can become difficult because they are not territorial creatures. The one that tore up your yard this week may not be the same one as before. Trapping and removal can become difficult. It’s best to let a professional handle the situation to make sure no harm is done to the animal, and the issue is taken care of, preventing the return of armadillos and other wildlife. 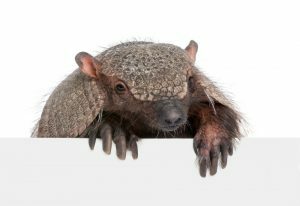 If you have an armadillo problem, let the trained technicians at Critter Control of Southwest Florida help you. Call us at 239-731-6255 or contact us on the web for all of your wildlife needs.